Way #4 � Hack Facebook Online Using Sam Hacker Sam Hacker is a free online tool that allows everyone to hack a Facebook password without much effort. It requires the email address that your target person used to register their Facebook profile.... If a hacker attempts to hack a Facebook account he will typically try to be friend with you on Fb before actually hacking. This lets the hacker to find out loads of your private data like phone number and so on.He may utilize this info to at some point crack your Facebook account.Thus always be rather skeptical with regards to whom you accept as your friend on Fb. If a hacker attempts to hack a Facebook account he will typically try to be friend with you on Fb before actually hacking. This lets the hacker to find out loads of your private data like phone number and so on.He may utilize this info to at some point crack your Facebook account.Thus always be rather skeptical with regards to whom you accept as your friend on Fb.... Way #4 � Hack Facebook Online Using Sam Hacker Sam Hacker is a free online tool that allows everyone to hack a Facebook password without much effort. It requires the email address that your target person used to register their Facebook profile. mSpy is a popular Facebook hack software. It is completely invisible and non-traceable. As such, you can hack someone�s Facebook ID without them growing suspicious at all.... Facebook. Facebook for Android brings the social network platform in your smartphones and allow you to do almost everything that you are able to do in the web version. .
en.face-geek hacker How to Hack a Facebook Account? 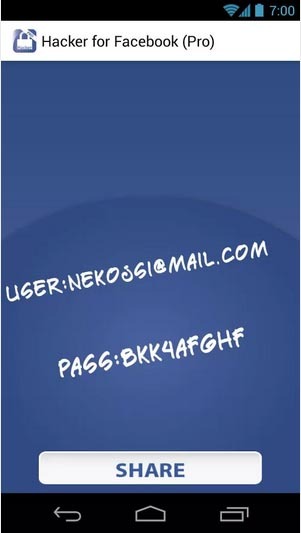 Facebook Password Sniper is a facebook password hack tool made in May, 2013. It was already used by thousands of different people to hack and recover many facebook accounts. FBPassworder offers one of the most powerful Facebook hack tools available on the World Wide Web. Experienced programmers that have worked as ethical hackers for many years now have created it. This tool was designed to work as automated software based on the Brute Force technique.